At the top of Mt. 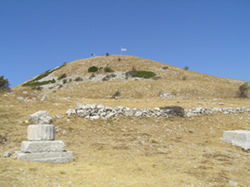 Lykaion, “the Arcadians sacred summit”, Zeus was worshiped, while nearby lies the Ancient Lykosoura, which Hesiod considered “the first city of humanity on Earth. 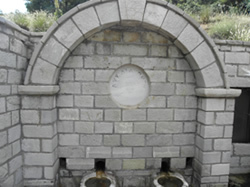 Along the road to Ancient Lykosoura, from Mountain Lykaion is Agno Spring, which gives fresh water more than 2500 years. In the village of Vasta is Agia Theodora. 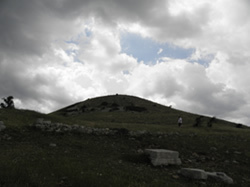 The area was inhabited by the Pelasgians. Either the king of the Pelasgians Lykaon as the founder of Ancient Lykosoura, or the father of Figalos, was the founder of Ancient Figaleia. Figalians built on their site with Ictinus (the architect of the Parthenon), the famous Temple of Epicurean Apollo, who helped the city to recover from the Spartans. The legends and traditions like the youth of the neighboring Kingdom of Figaleia bathed in the waters of Neda River, in order to get power, while history says Figalieis had such force that sent ships to the Trojan War. Sometime in the fertile soils of the valley came to inhabit the Pelasgians, who initially fed with nourishing fruit of the oak-trees growing on the slopes of the valley (that was the reason Pythia called them acorn-eaters). The son of King pelasgic Lykaon, was the founder of Lykosoura and father of FIGALOU, who founded Figaleia (and other myths say, that Figaleia was a Dryad, a Nymph of the forest). Lycaon was believed to have founded the city of Lycosura, to have established a Sanctuary of Zeus Lycaeus and to have started the tradition of the Lycaean Games, which Pausanias thinks were older than the Panathenaic Games. Today the Lycaean Games, take place every four years. In Lycosoura there is a small Museum, as well as the Temple of Demeter’s Daughter, Despoina, a local Arcadian Deity.